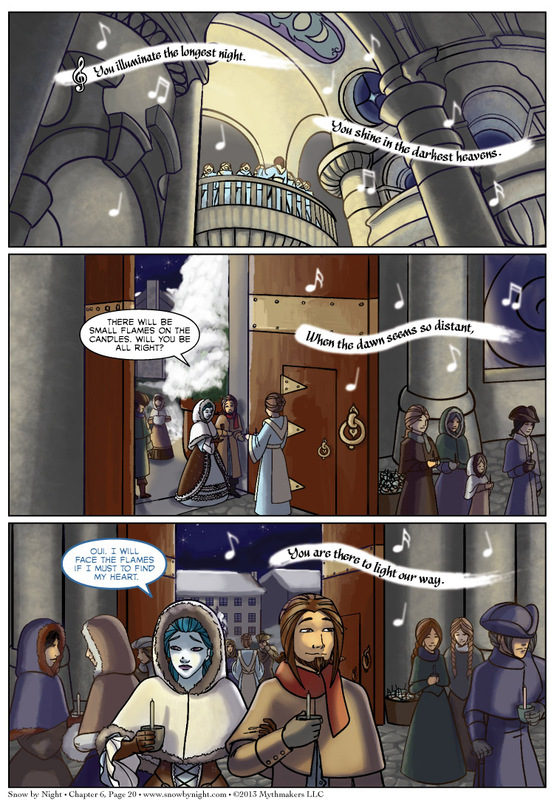 Snow-by-Night and Blaise enter the Temple of Giavere to the hymns of the choir on Chapter 6 Page 20. I hope those candles don’t cause problems for Snow. 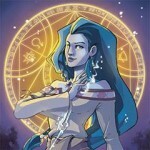 To see a preview of next Monday’s page, vote for Snow by Night on Top Web Comics. Look to your left, Snow, it could be right there although you don’t recognize it (yet). Oh goodness, I love this story. You’re not expecting the candles to cause Snow to snap, laying waste to the entire temple, are you? That would seem to be very out of character both for Snow and for the comic itself. On the other hand, there was the gentleman they met at the opera who was a bit too interested in Snow. Then there’s the whole thing going on with the alchemist who wants to drain and harness all of Snow’s power for herself. Either of those could kick in right now and ruin the moment. …More than a bit, yes. BLAISE: Look out everyone! She’s going to blow! PRIEST: There goes our security deposit.